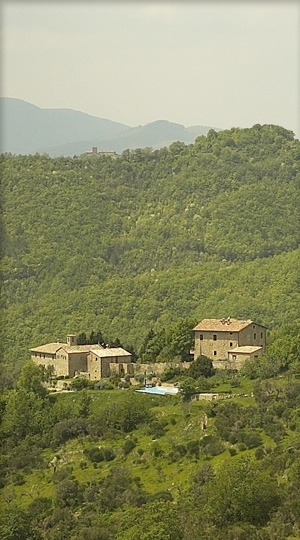 Join us for a ten-day silent residential retreat in Italy beginning in October 2020 at a spectacular villa near Perugia, Italy, a facility in the lush hills of Umbria with pool, spa, hillside trails, ancient Roman roads, springs, and gourmet food. (The venue is Michelin-rated). This will be our seventh retreat at this facility–a place that I often dream about when I am not there. The day includes two sessions of Dharma Dialogues, several short group sittings, group walks, and two sessions of yoga per day. All sessions are optional except attendance at Dharma Dialogues. Once you have registered, we will send confirmation and, in September, more details to help you plan your trip and to coordinate a shared van from the Rome airport and back. In case you want to make advance flight plans, please know that we arrange a bus to pick you up at Rome’s FCO airport on Oct. 24 at 3 pm and return to either Rome center or FCO on Nov. 3. The price of the bus depends on how many are sharing it but usually runs about €40 each way and is about a two hour ride from the airport. If you are coming from overseas, please plan to arrive into Rome at least a day ahead. Our retreats at this facility the past six years were the most profound and certainly the most elegant of my 44 years of attending, organizing, and leading retreats. My premise is that an immersion in both silence and beauty is a prescription for physical and mental health. I am thrilled to be returning to this heavenly place and would love to share it with you. PRICE AND DEPOSIT: The cost for the ten days is €2,500 for a double room and €3,200 for a single, which is all inclusive (food, lodging, teachings). To register, you may make an initial deposit of €400 for a double or €700 for a single; this first deposit is non-refundable. The links below allow you to pay your deposit in the equivalent of either US dollars (USD) or Australian dollars (AUD). The payment in USD is for US citizens only. By Sept. 1, 2020, we will need an additional €1,000, which is also non-refundable. You will then bring the final balance with you in cash euros or else we will make arrangements for payment in another currency closer to the date. Should you need to cancel and you are a U.S. citizen, we can turn your deposit into a tax-deductible donation. FOOD: We will no longer be able to accommodate any special food requests other than gluten-free. The food there is world-class vegetarian gourmet, and they produce it out of a small kitchen. Due to the size of the group we expect and the length of the stay, we will be offering only what they serve and not ask them to do any other special diets (other than gluten free on request). There are usually plenty of options to accommodate people’s (non-flesh) diet needs. ACCOMMODATION: We assign the rooms in the order in which we receive your deposit. We expect the main villa in which the events take place to fill up quickly, but we will also be using two nearby villas, one within an easy walk and the other a longer walk (all on a charming country road) though we will have shuttles going back and forth throughout the day and evening. Ancient paths leading to quiet streams, walls of stone aged by the centuries, stylish rooms of exotic and antique furnishings, gardens of manicured lawns and olive trees, the scent of jasmine, lavender and rosemary filling the air, gourmet vegetarian meals, a swimming pool kissed by sunlight. Outdoor hot tub and indoor steam room. Candle-lit dinners, and calm nights under a star filled sky.